A plethora of basalt boulders cover the peaceful grassy hills inside Vacaville Open Space. Vaca means cow in Spanish, so don’t be surprised to see a lot of happy California cows grazing all around the trails and boulders. Small stone walls built around the boulders are to keep the cows from crapping and making potholes under the problems, so please do not tip the walls over (or the cows). High enough above the suburban sprawl that you can barely hear a lawn mower or a school bell, these boulders are always a nice place to hang out with great views of the Sacramento Valley and on a clear enough day, even the snow capped Sierra. Bay Area climbing legend Scott Frye did the hardest problem, Scott’s Traverse V7/9. 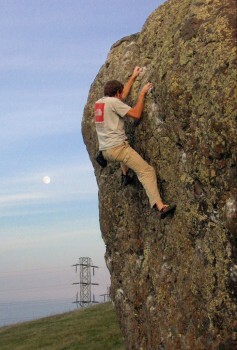 Which SuperTopo guidebooks cover Vacaville (Nut Tree Boulders)?